In October 2011, CADRE sponsored it’s 5th National Symposium on Dispute Resolution in Special Education. I was invited to present about SpeEx. Since SpedEx has become so timely and national (see my last few blogs), I am happy to provide my material and this video. Enjoy! In the intervening years, SpedEx has continued to be successful and grow (though it is still a pilot program) in Massachusetts. For those of us who have been involved with SpedEx, it’s been been gratifying to see the AASA (American Association of School Administrators) and Education Week highlight this consultant process as a dispute resolution model. Education Week highlights SpedEx–our Massachusetts reform–in discussing that AASA report! I hope you have a chance to read this blog in Education Week. It summarizes the American Association of School Administrators recommendations to fix special education due process. The AASA recommends four dispute resolution processes, including a consultancy model–and the end of due process hearings. Amazingly, Ed Week reports that the AASA cites our Massachusetts reform effort–SpedEx–as its model! For information about SpedEx please visit http://Spedexresolution.com. I’m delighted to see SpedEx get this well-deserved national attention. It is a small, successful dispute resolution model that is free to parties, builds trust, focuses on the child’s need for a free appropriate public education (FAPE) in the least restrictive environment (LRE), and it’s quick! Check it out. I do have some issues with how SpedEx was described, but let’s leave those for another day. In the long saga of education reform, with all its talk, writing, and action, special education has been largely absent. It stayed on the back burner. Reformers seemed afraid to touch it. Until now. The AASA, the national organization of general and special education public school administrators, placed reforming special education due process squarely on the reform agenda—a huge step forward. I applaud them for it. AASA hopes to “spark a thoughtful, new dialogue about the need for critical changes to the special education dispute resolution system.” I agree such a dialogue is overdue, even though, in the spirit of dialogue, I question and don’t necessarily support some of the report’s arguments, information, and opinions. The report contends “modifications to the current due process system could greatly reduce, if not eliminate, the burdensome and often costly litigation that does not necessarily ensure measurable educational gains for special education students.” And, I would add the pervasive costs (in money, emotion, time, and pressure to comply with burdensome regulations) that create fear of litigation in schools and confusion and anxiety among parents. Specifically, the AASA recommends that a special education dispute between school and parents be resolved through the following four steps: first, facilitated IEP meeting; second, optional mediation; third, consultant IEP process; finally, if the dispute remains unresolved parties can litigate in court. Note that the first, second, and fourth steps already exist. The AASA recommends the elimination of due process hearings. In its third step—the consultant IEP process—the AASA specifically cites SpedEx, the Massachusetts dispute resolution option. See page 23 of the report. http://spedexresolution.com/ FYI–here’s more information about SpedEx. Since 2009, SpedEx has been piloted as a successful, state-funded, voluntary dispute resolution option. Briefly, SpedEx helps schools and parents resolve their own disputes in a child-focused, trust-building, efficient (30 days), free-to-the-parties way—without waiving due process rights. The use of SpedEx is limited to the issue of the child’s proposed IEP (Individualized Education Program) of services and placement. It is designed to assure that the IEP provides a free appropriate public education (FAPE) in the least restrictive environment (LRE). To get SpedEx started, both parties have to agree on which consultant the state will hire for them—a first step in the trust-building process. Later, if they both agree with the consultant’s report and develop an accepted IEP, SpedEx provides an opportunity for the consultant to observe the student in the accepted program. I believe that SpedEx has great potential for other states. To start the conversation, the AASA proposed and provided details of its own consultancy approach. In the spirit of dialogue, let me add one of several concerns I have about its proposal. The AASA’s proposal is not voluntary and parties are bound to implement the consultant’s report for an agreed-upon time, after which they can seek court action. I believe a consultant model should be a voluntary option, without eliminating due process hearings thereby. Instead, how about we follow what I call the ‘dinosaur approach’ to fix special education’s dispute resolution mess? Let’s create several attractive options, such as SpedEx, so fewer and fewer people resort to due process hearings. Already, there’s a decline in the number of hearings nationwide. We don’t need to eliminate hearings per se (probably not a winnable argument anyway) to fundamentally fix the system. Rather, as the dinosaurs did eons ago, let’s help hearings become extinct in two ways: (1) by eliminating many burdensome requirements that create the fear of litigation and confusion, taking precious time away from teaching and learning, and (by) by adding better options for parties. One more thing. The AASA report assumes that private enforcement due process hearings should continue. I believe it may be time to question that assumption in a larger dialogue about fixing special education, beyond substituting one dispute resolution mechanism for another. But, let’s leave that for another day. For now, the AASA has done an important public service in starting the national conversation about fixing special education due process. I applaud the AASA for doing so. There is no doubt that together we can create better solutions to serve all students in our schools. Let the dialogue begin! Here’s a video, a few moments long…. of the children’s school crossing signs exhibit at the Boston Children’s Museum. 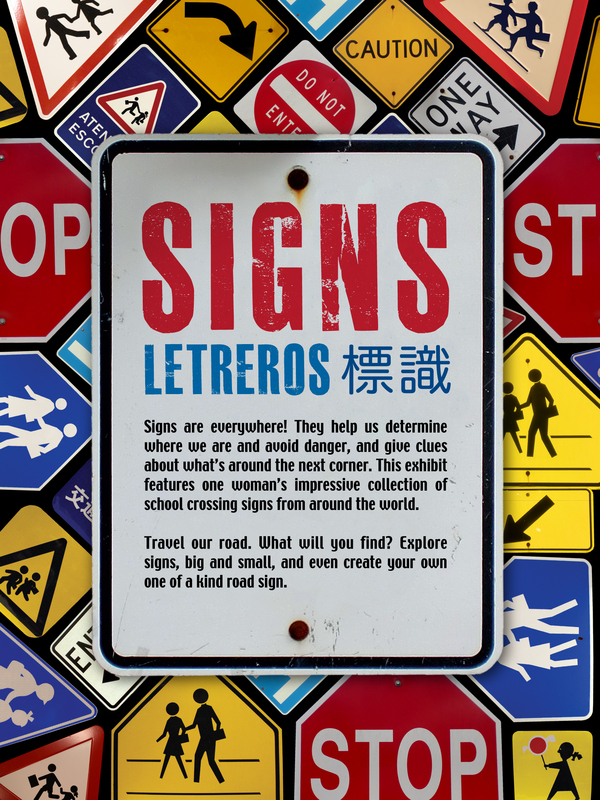 Boston Children’s Museum exhibit of international road signs. I hope you enjoy it. The video, made by Warren Zapol, cuts into the middle of my discussion about how this collection came to be. 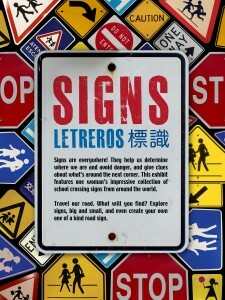 You’ll see glimpses of many school crossing signs from around the world. It was a wonderful exhibit and I thank the Children’s Museum for it. Thank you, AASA for fostering the dialogue to fix special education due process. The AASA, a national organization of general and special education administrators, placed reforming special education due process squarely on the nation’s education reform agenda. That is a huge step forward and I applaud them for it. AASA hopes to “spark a thoughtful, new dialogue about the need for critical changes to the special education dispute resolution system.” I agree that such a dialogue is long overdue, even though I question and don’t necessarily support some of the report’s arguments and information. “The report contends modifications to the current due process system could greatly reduce, if not eliminate, the burdensome and often costly litigation that does not necessarily ensure measurable educational gains for special education students.” And, I would add the burdensome costs (in money, emotion, time, and the constant pressures to comply with regulations) that foster rampant fear of litigation in our schools and confusion and anxiety among parents. Specifically, the AASA recommends that disputes between schools and parents about children’s special education placements and services be resolved through the following four steps: first, facilitated IEP meeting; second, optional mediation; third, consultant IEP process; finally, if the dispute remains unresolved parties can litigate it in court. Note that the first, second, and fourth steps already exist and that through this proposal, the AASA recommends the elimination of due process hearings. While I might personally love to see SpedEx go national, I understand that AASA has put out a somewhat similar approach which, I believe, is to be viewed as a conversation starter. So to help that discussion, I’d like to say that I have concerns about the report’s approach. Its proposal for a consultancy model is not voluntary and the parties are bound to implement the consultant’s report for an agreed-upon time period after which they can seek court action. I have concerns about making a consultancy model the only option for parties and eliminating due process hearings thereby. How about this for a better way to fix special education’s dispute resolution m? Let’s follow what I call the ‘dinosaur approach.’ Let’s create attractive options, such as SpedEx, so fewer people resort to hearings. Already we see a decline in the number of hearings nationwide. We don’t need to eliminate hearings (probably not a winnable fight) in order to fundamentally fix the system. Rather, let’s help hearings fade away as the dinosaurs did eons ago. Let the dialogue begin! I’m sure that together we will come up with great solutions. And, my little flipbook, Fixing Special Education at my website: www.schoollawpro.com/store. As a nation, we need to have that larger dialogue about how to educate ALL students—including students with disabilities—in the most effective results-based way. Let us even consider the possibility that this law, with its entitlement and due process system, should be replaced by something more appropriate for current realities for all students. After all, this 1975 law has succeeded over the past almost 40 years in providing access to all students with disabilities to school programming. We should consider replacing it, rather than continuing to grow it into more and more complex and unintended consequences. This, too, is a dialogue we need to have—changing the entire special education system, beyond substituting one dispute resolution mechanism for another. But, let’s save that for another time. For now, as you can see, the AASA report has done a tremendous public services by raising these critical issues about special education due process. I applaud the AASA for doing so at this time. Let the dialogue begin! I have no doubt that we can all do much better! Finally! A major group (AASA) is looking at special education’s broken due process system….. The American Association of School Administrators just issued its report, Rethinking Special Education Due Process. It is well worth reading. Agree or disagree, I applaud the AASA for stepping out and promoting this important national discussion. The due process system is broken, as I have written–and spoken about– for many years. It’s well beyond time to fix it. Let’s hope we now have a robust national discussion. Onward and upward to a more effective, equitable, and outcome-based schools for all students!